In our town, the city department used to lay down a mix of sand and gravel to make the roads safe during winter travel. The material was called “tailings”. It came from the mining shafts, dug up and dispersed once the lead ore had been excavated from deep below. With the closing of the mines, tailings have been replaced with road salt. This seems like an appropriate metaphor for my current situation with blogging. Right now I am feeling like I am doing more reposting of events from my website (mattrenwick.com) than actual writing. What I don’t want to see happen is for Reading by Example to become the repository for my own writing tailings – the rejected articles and ideas from my other writing outlets. My situation is not a bad one; I’ve found opportunities to write for multiple audiences and get compensated for my time and efforts. I am thankful. Yet this means less time to write in this space. I’ve connected with multiple people who have shared their appreciation for what is posted here. That’s why now seems like as good a time as ever to open up this blog to other writers who are also literacy leaders – teacher leaders, lead teachers, instructional coaches, prospective administrators, assistant principals and head principals, curriculum directors, superintendents, university faculty, consultants, thought leaders – anyone who has knowledge to share and a story to tell. This could be an opportunity for educators who have not blogged before, who are new to writing online or might like to drive more traffic to their own blog. I realize I am making a large assumption that people would want to write in this space at all. Having over 800 subscribers does help hedge this bet. I’m not interested in being an editor, but there are some questions I would like prospective contributors to respond to before we agree that this is right for both of us. See form below for more information. Related, the goal of this blog will be revisited. To start, it will no longer be merely my perspective, but one of many. Having a public forum and continuous dialogue about literacy and leadership is critical for schools and their respective students to be successful. I hope that by opening up this digital space for more voices on the topic, we might find it to be a much better resource for all. That’s the plan, anyway. Your comments and questions are, as always, very much appreciated. Around this time of year, I highlight selected posts written by bloggers within the past twelve months. What these posts all have in common is they were worth saving for my own learning and reading enjoyment. You might also find them helpful. This annual post is also my way to show gratitude for other educators out there who are taking the time to share their thinking online in an honest and thoughtful manner. This Wisconsin principal reflects on his experience as a spelling bee contestant during his elementary school days. He was wronged in his dismissal from the competition (there are two acceptable spellings of “judgment/judgement”). He applies this lesson to how educators approach learning with their own students, positively or negatively. This English teacher and author reveals how her life has changed as an educator since the birth of her daughter. Sacks lists four lessons she has learned since her family’s new addition: “Learning by Doing”, “The Value of a Network”, “Respect for the Caregiver of our Students”, and “Anything But Standard!”. Many parent-educators can relate. The late Grant Wiggins, co-developer of the Understanding by Design curriculum framework with Jay McTighe, takes on an Education Week commentary. James DeLisle questions the effectiveness of differentiation. Dr. Wiggins picks apart his argument piece by piece, showing the reader how DeLisle’s quotes are taken out of context and highlighting several resources that do support differentiation. Grant is and will be missed. A new idea, evidence of student and teacher learning, and a combination of humor and humbleness – these elements make this post an informative and enjoyable one to read. Mosher, a special education teacher, highlights the four steps she is taking to help her students become more actively involved in the goal setting process of individual education plans. Some of our faculty and I actually used this process for a two day curriculum writing workshop this past June. Moore’s process worked well for us. The best advice I found from her post is setting dates for publishing student work. This has kept all of us accountable for completing our writing genre units of study. Of note: This site won the 2015 Edublogs Group Blog Award. Sibberson, teacher and author, offers a classroom activity to help students reflect on their reading lives: Write 100 things about themselves as readers. She admits that no one ever gets to 100, but encourages her students to add to the list during the school year. Franki posts her own reflections as a reader (31 and counting). “Writing ‘I can’ statements or the ‘Standard for the Day’ on the board felt forced and unnatural. I wanted it to be more about the awareness of learning and being responsible for using that learning.” Identifying a felt difficulty, Buckley instituted “Learning Reflections and Frames”. Source: Stenhouse Blog. Used with permission. All rights reserved. Instead of listing expectations, this teacher and author now sets collective goals with her students. They also reflect on how well they met their goals at the end of the week. A simple yet powerful change in practice. There are a litany of posts about homework that get published every year. Starr’s rises above the rest. She reflects on her son’s own school experience with his homework load, worrying that this work he finds too easy is “a waste of time at home”. In response, Starr differentiates between what homework “can be” and “shouldn’t be”. Matt, an elementary school principal, received a very positive wake up call from the hotel staff where he was staying. This experience served as a good reminder for him in his own interactions with the students, staff, and families at his school. Matt also puts it on the reader to reflect on our language as professionals and the impact it has on others. Elisabeth, an English professor in Nebraska, uses the everybody book The Story of Fish & Snail by Deborah Freedman as a springboard for her students to write about bravery in their future classrooms. She shares several of their responses in her post. Dr. Ellington also provides commentary about the nature of writing instruction in classrooms, especially the importance of taking risks as a teacher who models this craft for learners. Writing that feels safe is often writing that’s just going through the motions. When I’m uncomfortable in a piece of writing, that’s when I know I’m getting somewhere. This high school teacher from Michigan collaborates with his school librarian to create a learning space “to give students access to tools on their own to see what they will create”. Nicholas provides examples of student-driven projects, including a prototype for a knee brace that would keep a kneecap in place and a prosthetic hoof for horses. This post makes it clear that #makingmatters. Lemov is an education reformer, with most of his experience in the corporate charter school movement. His book is focused on improving test scores through uniformity in teaching. The accompanying videos show lots of desks in rows, with teacher standing and delivering instruction to the masses. I have not read Lemov’s books, but this blogger’s commentary makes me wary of his work. Dr. Shanahan, Professor Emeritus at the University of Illinois at Chicago, takes to task an article from The Atlantic that admonishes the teaching of reading in kindergarten in the U.S. (in comparison to Finland’s more relaxed approach). For starters, the U.S. has a more diverse population with many different cultures represented. He also points to the higher level of parent education in Finland. Reading instruction is beneficial for early learners, Shanahan notes, provided that these experiences are authentic and research-based. Teachers are always on the lookout for ways to be more effective with limited instruction time. Sztabnik, a high school English teacher from New York, enlists the 80/20 rule (“Find out what is vital, ignore what is trivial”) to prioritize practices. For example, he recommends asking better questions while teaching to promote student thinking and deepen their conversations. More time is spent being an active part of learning. What blog post(s) that you read this year were most memorable? Please share the link in the comments along with why they are worthy of recognition! You can access previous year’s most memorable blog posts by clicking here. This is my third annual recognition of the most memorable blog posts I have read this year. Like in 2012 and 2013, I cannot say for sure if they were the most viewed or shared. They just stuck with me, even to this day. Anne Lamott stated in Bird by Bird: Some Instructions About Writing and Life that “good writing is about telling the truth”. Maybe what sets these posts apart for me: These writers told the truth, with so much clarity that I couldn’t help but read and respond to them. This guest post garnered 285 comments. As the title states, an educator takes the role of a student in the high school school where she works. She discovered three things: 1) Students sit all day, and it is uncomfortable, 2) While they sit, they listened passively in 90% of the classes, and 3) She felt like a nuisance when raising her hand to ask questions and participate. This instructional coach concludes with three ways she would change her instruction if she were back in the classroom. Kathy, a 1st grade teacher from Canada, acknowledges what many educators experience in the classroom: Integrating technology into instruction is messy. She offers smart advice to other teachers, such as considering what learning you want to enhance when bringing in tech, and recognizing the unique ways digital tools can provide a global audience for students. Kathy encourages the reader to reimagine technology as an essential part of a connected classroom. In response to other readers’ sharing their experiences regarding Lois Lowry’s classic title, this first grade teacher shares his own. Dylan laments about how points and prizes were awarded to the students who read The Giver in the appropriate time allotted by the teacher. He was not awarded anything, and was actually punished, because he had taken his time to read and immerse himself in this excellent story. Dylan recognizes that this practice almost killed his love for reading, and probably did for some of his classmates. Starr, a high school English teacher and a guest blogger for Education Week’s Work in Progress, points out the difference between the Common Core State Standards (CCSS) and the new computerized assessments that attempt to measure students’ proficiency in them. She points out that the only difference between previous state standards and the CCSS is that now everyone is speaking the same language. Starr also lists a variety of benefits that the CCSS has provided, such as being skill-based instead of content-heavy. This post found me at just the right time. It was July, and I was already starting to think about school, which involved getting nervous about the upcoming principal and teacher evaluations going live. This education consultant’s suggestion of reframing our challenging situations as questions helped me come up with a good approach for collecting artifacts to support teacher’s professional practice goals. For more on this topic, I recommend Warren Berger’s A More Beautiful Question, the best education book I read this year. A principal from Michigan reflects on his process for working with students who come his way due to poor choices they made. It was prompted by a project he did years back as a 5th grade teacher, related to selecting careers and thinking about the future. This year, he has taken a similar approach by asking students who visit his office a series of questions regarding themselves, their current mindset, and what they think their futures might entail. Ben’s attempt to help his students reflect and set positive goals is admirable. This post about the ubiquitous national standards focuses on what the ramifications might be when we test primary age students. Mary Ann reflects on her own young child’s experience with an online test, selecting answers out of interest in language instead of picking the “right” answer. She worries that our country’s affinity for multiple choice tests will stifle student creativity and experimentation. It is hard to disagree with her. By just the number of posts in this list alone, it is clear that the Common Core has been a huge focus this year. According to Ann Marie Corgill, Alabama’s Teacher of the Year in 2014-2015, why is that? It is the teacher who makes the difference. The standards are there to provide guidance, and not to dumb down a child’s learning experience, one of many misconceptions flying around that Ann Marie attempts to clear up. She finishes up her post by inviting anyone interested in the CCSS to come visit her classroom and see them authentically addressed in her instruction. This post prompted me to buy Paulo Freire’s classic education resource Pedagogy of the Oppressed. Okay, it is still on my bookshelf collecting dust, but I am closer! Steve openly wonders what the author would think about the participatory nature of the Internet and how his ideas for progressive instruction might be applied. He links six quotes from the text with how blogging allows for more equality among learners and thoughtful ways to connect with others online. Liz, a librarian, has grown tired of the constant discussion about the role of fiction in readers’ lives. She feels there is too much focus on encouraging people to read literature because it is “useful” (this post was prompted by a New York Times article). Why isn’t it okay to read fiction because it is fun? Liz asks. She acknowledges that this focus on extracting knowledge as the main purpose of reading is driven by the high stakes testing environment. People should read for pleasure and not see it as a waste of time. What posts inspired you to respond and share them with others? Please share in the comments, and have a great New Year’s Day! In another lively #educoach Twitter chat, we discussed the first chapter of Donalyn Miller’s book Reading in the Wild. This excellent resource provides educators with many ideas on how to raise readers for a lifetime, and not just for that next test or quiz. A topic that came up near the end of the discussion was reading logs. There were multiple responses. Most of them were not favorable toward this practice. I realize why educators use reading logs: We want students to become habitual readers. But why do we develop habits? A habit is a behavior that we repeat over and over because we experience something positive from it. Reading logs do not develop lifelong readers. It is the act of reading itself – the entertainment to be had, the information gained, and the subsequent socialization we experience – that keeps us coming back for more. So how can we rethink this assessment tool, so that the accountability we place on students to become more regular readers augments instead of detracts from the experience? Our 4th and 5th grade teachers all attended a one day workshop with Donalyn Miller last fall. Reading graffiti boards is an idea suggested by her. The teacher puts up black butcher paper. He or she then models how to write favorite lines from their book they are reading on the board. Metallic markers make the writing pop out. 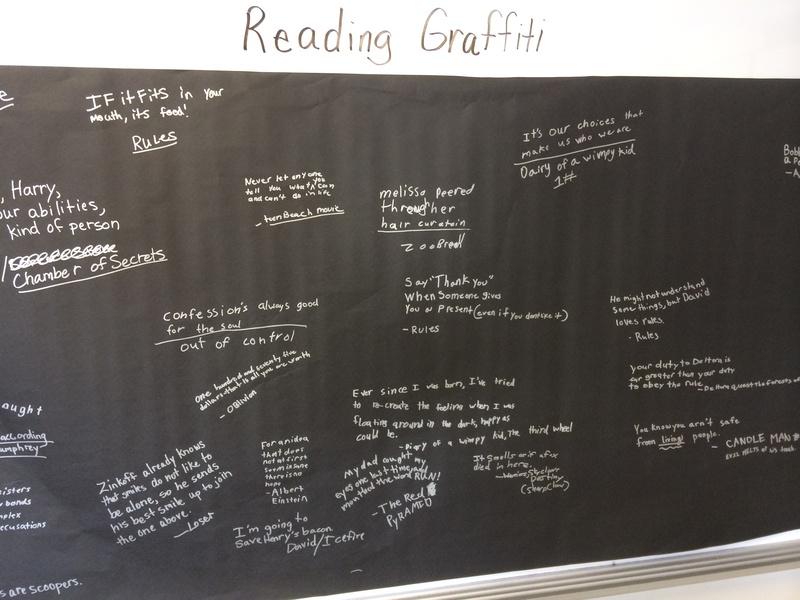 During my regular walkthroughs, I enjoyed watching this graffiti board expand with student contributions. This tool for sharing led to students having more authentic peer conversations with each other about what they were reading. It also served well as a natural way to recommend titles. Would this have occurred with reading logs? My son hated filling out his reading log as a first grader this past school year. It was like pulling teeth, as they say. 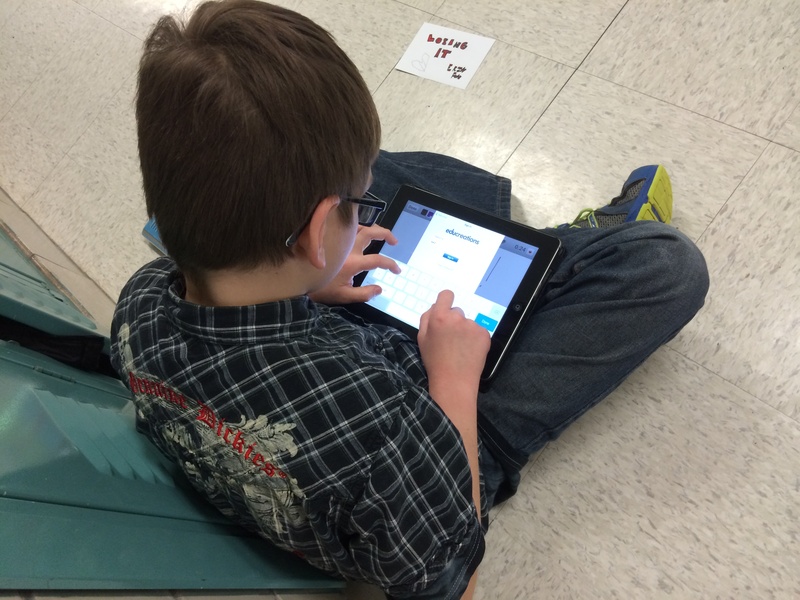 Because he liked technology (just like his dad:), we tried blogging about his reading instead. We used KidBlog as our writing tool. Initially, it was still the same process of forcing him to respond to his reading. But once he started getting comments from family members, such as his grandmother, he became more motivated to share his reading life. We hit pay dirt when one of his favorite authors, Johnathan Rand, posted a comment on his blog post about his book series Freddy Fernortner: Fearless First Grader. (I had emailed the author my son’s post about his books, in hopes of him responding.) 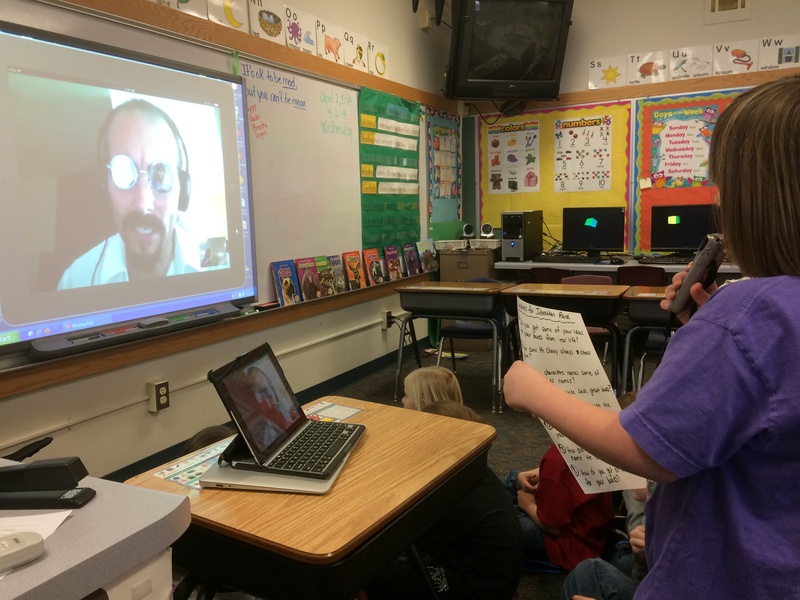 After a discussion in the comments, including many questions from my son, I suggested hosting a Skype chat between the author and his classmates. Before the Skype chat, the classroom teacher had the students suggest several questions for Mr. Rand. When they finally did connect with him, students had the opportunity to come up and speak with the author, each with a question in hand. After this experience, I was told that many of my son’s 1st grade classmates were much more motivated to read, especially the Freddy Fernortner chapter book series. This included one student who last semester was in Reading Recovery. In another one of our 4th grade classrooms, a teacher had discovered Educreations. This is a simple web-based screencasting tool that can be used on iPads and other mobile devices. Students in this classroom still had reading expectations, but they were to create a book trailer for a title they had recently read. Book trailers are visual and audio summaries of titles, with the purpose of convincing someone else to read that book. The students in this classroom regularly shared their creations with their peers by mirroring the content onto the whiteboard. I was told that one of the more challenging students in this classroom, who refused to do much of any other work, was highly motivated to create these book trailers. I realize my repeated question is rhetorical. The reactions, products, and feelings toward reading that I listed would not have occurred with the outdated practice of paper-based reading logs. There needs to be an authentic audience for the responses students are asked to produce about their reading. This audience creates a more profound purpose for these types of assessments and accountability tasks. What is your opinion on reading logs? In what ways have you augmented how students respond to their independent reading? How do you know it is working, in that your students are becoming lifelong readers? Please share in the comments. The Sunshine award gives others an opportunity to learn more about me as a blogger and then, in turn, I will send sunshine the way of 11 other amazing bloggers for you to get to know! 1. I have never traveled beyond North America. Cozumel (Mexico) and Victoria (Canada) are the farthest I have traveled from my home state of Wisconsin. 2. This year will be my eighth as an administrator. Before my current position as an elementary principal, I was an assistant principal and athletic director at a secondary school. I have spent the same amount of time as a classroom teacher at the 3rd through 6th grade levels. 3. Each role has their rewards and drawbacks, and I enjoy(ed) serving in both. 4. I have two kids – a son (7) and a daughter (5). They keep me moving. 5. I am married to Jodi. She currently teaches 2nd grade in the same district as me, but in different buildings. We literally met on the playground, when we were both teaching summer school. 6. During my athletic director days, I was also a WIAA certified official in baseball, softball, and basketball. There was always the possibility that a ref might cancel. I also coached junior high basketball for two years. 7. If I wasn’t in education, I could have seen myself as a landscape architect. I enjoy designing and installing gardens on my own property. Maybe that is why we bought a home with over an acre of land – I needed a large canvas. 9. I own at least four different Moleskine notebooks. They all have different purposes, such as reading notes, books I have read, and writing ideas. 10. I also own lots of tech. I have an iPad, an iPhone, and I am a premium user of Evernote. The Moleskine Evernote notebook might be the best invention of the year. 11. I don’t like cilantro, raisins, or mushrooms. If you have me over for dinner, please refrain from including these items in the meal. 1. Do you prefer to shop in stores or online? Online. This year, I made the mistake of going to Wal-Mart for groceries on Thanksgiving night. I didn’t realize Black Friday now crept into Thursday. Six? That includes my older ones that I probably just need to throw out. 3. What is your favorite type of music? Favorite band or song? Acoustic rock, especially unplugged songs from rock bands like Nirvana and The Foo Fighters. I am currently listening to The Lumineers. Dogs, although I don’t own one right now. Dogs are always happy to see you when you get home. 5. What is your typical bedtime? Around 10, but of course I have to read a little bit every night. Right now I am reading Invent to Learn by Martinez and Stager, and NOS482 by Joe Hill. Basing this on the conversation I seem to join the most, I will go with #educoach. I enjoy the dialogue, moderated by @principalj, @kathyperret, and @shiraleibowitz, around how administrators can take a coaching-like stance with their staff. I have never donated funds to either major party, so I would say “other”. In fact, I think money should be removed entirely out of politics. I think our current lack of government leadership is a direct result of this. Therefore, I don’t align myself with a party. It’s all too idealogical for me right now. 8. Best place you ever vacationed? The two places I listed in my first fact: Victoria and Cozumel. I could see my family living in the former, and snowbirding in the latter (when we retire:). 9. Best book you’ve read in 2013? I really liked Wool by Hugh Howey. It is a dystopian novel about the remaining members of human civilization living in silos underground. There are lots of parallels to our current society in this science fiction series. It is actually a trilogy, with the first book starting in the middle of this epic. Thanks to Curt Rees (@curtrees) for recommending and sharing this book. 10. Favorite television show when you were growing up? Dukes of Hazard, no doubt. My family was also partial to reruns of the Andy Griffith Show. 11. What is one thing you never/rarely share that you are exceptionally proud of? I received state recognition in high school for singing and for playing baseball. I know, a very unique combination. But if you see me, don’t ask for a solo. I only sang in duets and quartets. 1. What songs/bands are on your favorite playlist right now? 2. What book would you recommend that you own in multiple formats (print, digital, and/or audio)? 6. Who is the most important person(s) in your life right now? 9. What will be your 2014 new year’s resolution? I failed last week to get a Friday Focus out. I see the world is still spinning. To be honest, now that there is a Friday Focus and a Monday Musings, I am struggling to find the time and the content to do both well. My initial purpose for starting this staff blog was two fold: To share more information, and to model how you might use a 21st century tool with your students. I hope I have accomplished both. However, the last couple of weeks I have noticed on the statistics that there are less people viewing the blog. That could be because I was embedding the posts in the emails. But I am also seeing a pattern: The only times when people view the blog are on the days they are published. Blogs are meant to be come back to, kind of a home base for information. Maybe it is redundant with our Howe Google Site. With that, I would like you to check out the poll to the right. Please answer it honestly. I will continue the Friday Focus regardless. There is something about having a piece of paper in your hands that makes our ideas in writing permanent and real. For instance, although I have stopped printing my emails out quite a while ago, I still find myself preferring to read the news on actual paper. If you would like to take a crack at posting your own thoughts online in a safe environment, maybe our Google Site is where this could take place. The audience is limited to us. For example, you could post a video tutorial you and/or your students created, explaining an academic concept or showing how to use a tool on the iPad. I will ask PTC if they would support your extra efforts with the iTunes cards again. I appreciate your willingness to continue innovating with me on behalf of student learning. This post is my last of November. Just before the month started, I pledged to write one post a day every day for the month. Now it is over and I almost met my goal (29 posts – not too shabby). I have learned a lot during this process. I thought I would share my reflections, along with how my experience might relate to teaching and learning. I think some people have the impression that journalists, authors and other writers just sit in front of a computer and the words magically come from their mind to their fingertips. I never believed that before, and after this experience I am even more sure of this. To generate new ideas every day requires a lot of mental energy before, during and after the actually writing of words. In fact, I bet I spent more time thinking and revising than I did in actually producing a post on my blog that is worth reading. My experience is not much different than what we expect of our students to do every day. It is generally expected that students write every day in a variety of genres and formats. For me, there were a few days that I simply didn’t want to write, but I trudged on anyway. What helped is I had made a commitment. Students should also be making commitments, in the form of personal learning goals each quarter. This might help with our most resistant students. One of the best decisions I made in the beginning of this process was making a list of thirty ideas for topics to write about. They ranged on a variety of subjects, but they all had one thing in common: They were topics that I wanted to write about. As I decided on a post each day, I tried to stick to the schedule. However, many times I had an experience at school or learned something new from someone else’s blog and decided to write about that. Being flexible and having choice about what I wrote was very motivating for me. What percentage of your classroom writing assignments allow for at least some student input and interests? If it is less than 100%, I can understand why kids might not write to their ability or even flat out refuse to work. Writing is a deeply reflective process. It demands that the writer have ownership in their work. One idea that came to me is have students keep an updated list of topics to write about in a notebook, similar to what I did. Whenever an idea strikes, they can pull out this notebook and quickly jot it down for future reference. I’m sure someone has thought of this before, but it bears repeating. I have tried journaling in the past to be a more reflective practitioner. It always failed, and I think I now know why. No one was on the other end to read it and provide feedback. Once I started on Twitter, and shortly after began blogging, I became a much more motivated writer. I still get excited when I see a comment is awaiting moderation. And I have never had a negative comment, which is amazing considering I have probably been wrong on several occasions in my posts. My staff is very good about posting their student’s writing in the hallways. It’s a source of pride when I walk guests through my school for a tour. I also try to recognize their efforts by snapping photos of their work and having the students share them at all school assemblies as well as on Twitter. Our school’s next step is to start sharing student writing online. This has taken the form of attachments on emails to parents, blogs and ePortfolios. How has your school found a broader audience for your students’ writing? I was initially joined in this blogathon by fellow principals Tom Whitford and Phil Griffins. When one of us finished a post, we included the other two when we shared it out via Twitter. Often times, this was followed by at least a brief conversation about what we wrote and how it related to our positions and philosophies. Many times these exchanges of ideas led to other posts. It was a continuous cycle of think, write, discuss, reflect, and repeat. How much time are students given to experience the whole process of writing, including thinking, discussing and reflecting? I am as guilty as anyone at times of pushing teachers and students to use every minute at school to be actually reading and writing, as Richard Allington wisely encourages. However, what may not always be given its due attention is time for kids to process about what they wrote and share their thinking with others. I need to be more careful about what I perceive to be “down time”. Some instructional time, as precious as it is, needs to be allocated for students to speak with and listen to their peers, both in their classrooms and globally. When I first started blogging, I felt like I had to meet a certain word quota. If I was able to put down a thousand words, I felt like I had accomplished something substantial. As I quickly learned, number of words does not necessarily correlate with number of views. The blogathon helped me practice brevity even more. I was pressed to get my ideas down succinctly or risk doing nothing but blogging. Looking back at my statistics, some of my most popular posts were also some of my shortest. Not to state the obvious, but writing is about communication. What’s the point of communicating if no one is listening? I have learned through this experience that I have to be just as aware about my intended audience as I do about what I want to say. Writing is about the reader as much as it is about the writer. How do we model this for students? One way might be to write about something in front of the students. During the process, share your thinking with the students, such as “I think I am a little longwinded here. Let me see how I can shorten this up and get to the point”. The teacher could also get a quick check from the students by asking for their current engagement level on a scale of one to five. Then the teacher could ask the students why they were or weren’t engaged in what was being shared. This activity could also be an opportunity to teach students how to give constructive feedback. I laughed out loud when I read the title to one of Phil Griffins’ posts this month: “I am Never Doing Blogathon Again!”. I could definitely relate to how he was feeling. On the same token, I don’t know if I will feel that way a year from now. I really enjoyed the challenge and the feeling of accomplishment. My Personal Learning Network was also extremely encouraging as I wrote. They offered helpful feedback that helped me grow as a writer. I won’t lie; I am looking forward to taking a day off tomorrow, and maybe even the next day. At the same time, I feel like I have developed a healthy habit of getting my thoughts down in writing on a more regular basis. If we expect our students to do it, why not us?